Sounds just right stuff for the monsoon season. Will definitely try it out. Most of the veg fried items tastes better and crispier with a pinch of soda added to it. Hi Ajith Prasad, You are right, I too like to make fried items during cold weather. Vid, this will taste equally good with finely shredded cabbage (just steam it for few seconds before using). Try this.My friend Vimala had taught me this with cabbage. But, now I am going to try it out with carrot and beetroot. sure I will try with cabbage too. 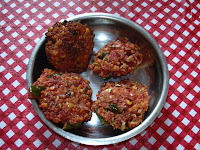 hi vidhya first time to your blog.. you have wonderful collection of recepies...beetroot vadai is new to me i will try..
will try beetroot vadai.. something new to me..